Movie lovers will journey into Jim Henson’s magical “Labyrinth” this spring when the 1986 fantasy-adventure returns to the big screen for three days only as a nationwide fan celebration from Fathom Events, The Jim Henson Company and Sony Pictures Entertainment. 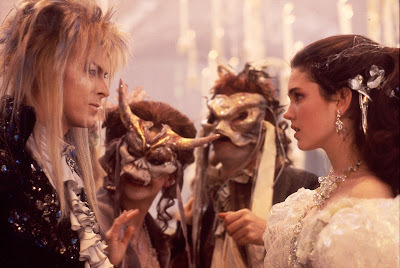 Starring David Bowie as Jareth, the Goblin King, and Jennifer Connelly as Sarah, who must rescue her baby brother by finding her way through the massive maze of the title, “Labyrinth” will play in movie theaters nationwide at 2:00 p.m. and 7:00 p.m. on April 29; and at 7:00 p.m. on May 1 and May 2 (all local times). Brian Henson will discuss the episode “Soldier and Death,” also directed by Jim Henson, and the special effects techniques that were a hallmark of “Labyrinth,” “The Storyteller,” and Jim Henson’s legacy. Tickets for “Labyrinth” can be purchased online at FathomEvents.com or at participating theater box offices. Fans throughout the U.S. will be able to enjoy the event in more than 400 select movie theaters. Directed by Jim Henson, “Labyrinth” was produced by “Star Wars” creator George Lucas and presented by Lucasfilm Ltd. The film’s screenplay is by Terry Jones of “Monty Python” fame, from a story by Henson and Dennis Lee. Brian Froud served as the conceptual designer of the groundbreaking fantasy, with music by Trevor Jones and songs by David Bowie.